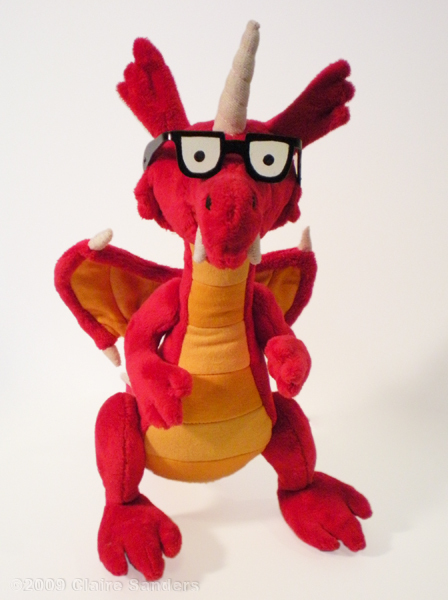 I made this plush toy of Alec's character Nogard for his Christmas 2009 present. It was fun working from Alec's illustration to create a 3D version of his fanciful dragon. I had to search all over San Francisco and Oakland to find the right colored fabrics and textures to match the illustration. Nogard is made out of low pile plush faux fur with a belly made of soft knit fabric. He has wire in his wings so they are flexible and stand out from the body. The glasses are made out of styrene (plastic) that I molded then painted over. Nogard has eyes painted on his glasses and eyes embroidered on the face, so he is a true 4-eyes. That way even if you take off his glasses he still can see. Nogard is just one of the awesome characters Alec has created that live in the Isle of Elsi. I put a couple more photos of Nogard in my flickr. A truly awesome work of art, Claire. Thanks so much, it's nice to make a gift that is so well received.